On the banks of the Skagit River in the late 1800s, an untamed wilderness was settled by Jasper Gates. He was followed by Harrison Clothier and Edward English, who had a vision for a new town. But before the city of Mount Vernon could become a reality, the early settlers would have to use simple tools and pure determination to clear two ancient logjams that prohibited travel up the river. Once the river was navigable, the logging industry could flourish, which, in turn, cleared fertile lands that would support world-class farming and culminate in a booming dairy industry. 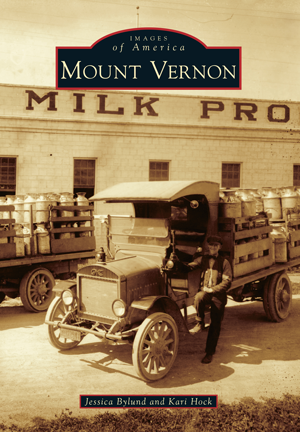 Eventually, Mount Vernon would be referred to as "Milk City." The area was a top seed producer as well as the site for food processing and canning. Today, it is best known for bulb and flower growing; every April, hundreds of thousands of people journey to view the spectacular flower fields. Local writers and recent transplants Jessica Bylund and Kari Hock explore the extensive photographic collections of the late Roger Fox, John Kamb Jr., and many other longtime residents and history enthusiasts of Skagit County. This extensive and well-researched visual history includes more than 200 vintage images accompanied by informative captions.